One of the things that makes car camping fun is hanging out around the campfire. 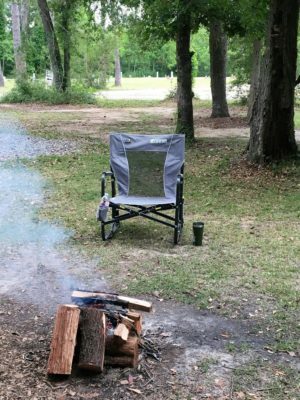 The FirePit Rocker from GCI Outdoor makes hanging out around the campfire even better because it is super comfortable. I like the ability to lounge with my legs straight out and gently rock back and forth while enjoying a beverage. To read more of my update click here. The Blackstone Griddle has performed as advertised. It is easy to cook on and I like that I can generally cook an entire meal at one time. Seasoning and cleaning was a bit of a chore at first but has become easier, and the griddle is easily transportable, but maybe not in the way Blackstone envisioned. Click HERE to read my full update on my Blackstone Griddle Review. 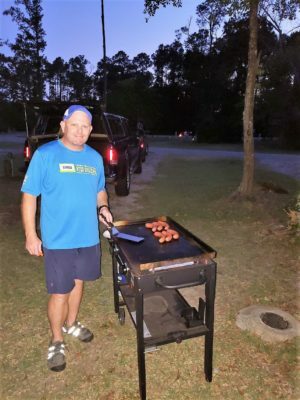 Cooking Venison hot links on the Blackstone Products 28″ Griddle.